The U.S. government’s decision to proceed with imposing sanctions on Venezuelan state-owned oil and natural gas company PDVSA was a primary driver of crude markets last week. The decision was purely political, with the objective of denying Venezuela President Nicolas Maduro’s access to oil revenue. The United States’ goal appears to be to shift power to President Juan Guaido. Guaido has been recognized by the United States, Canada and several South American countries as the leader of Venezuela. Guaido is serving as the president of the National Assembly of Venezuela. Upon Nicolas Maduro being sworn in for a second term as president, Guaido was declared the interim president on Jan. 11, 2019, by the National Assembly. Though Maduro is considered to still be in power, Guaido believes domestic and international pressure will force Maduro from office, causing a peaceful and constitutional change that will make Guaido president. Under Maduro's socialist rule, the economy of Venezuela has collapsed, making it difficult for most Venezuelans to get food and medications necessary to survive. Inflation also is at astronomical levels. Maduro’s regime has been toxic for Venezuela, and he is preventing legitimate elections. Outside of Russia and China, there are few countries that do not believe it would be in the best interest of Venezuelans for Maduro to be removed from power, but the decision by the United States to support such a change is not without consequence for the U.S. refining industry. The sanctions could potentially block a critical source of heavy crude from U.S. refiners, which will put upward pressure on prices. Most of the growth in U.S. crude production has been light crude. Most U.S. refineries are set up to run heavier crude, which is why the United States exports light crude and imports heavy crude. 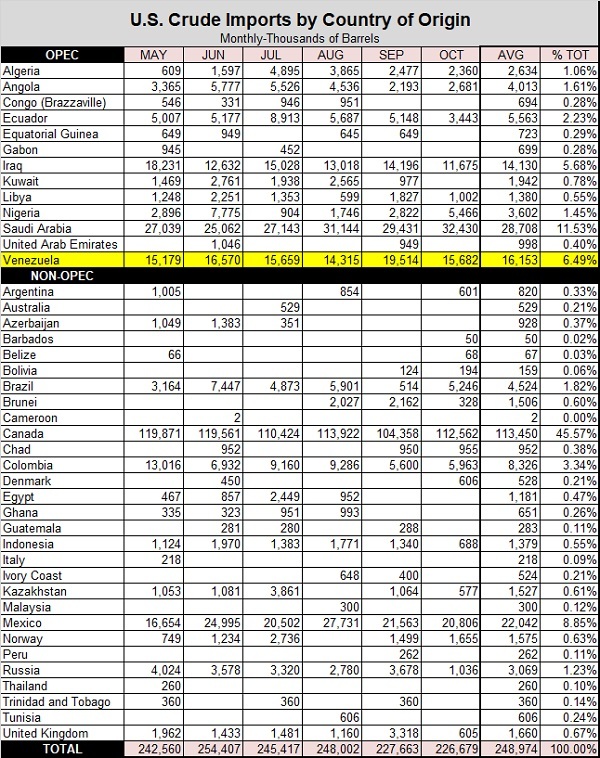 The table above lists U.S. crude imports by country of origin through October 2018, the last official data available. We provide this table to put into context the decision to impose sanctions on Venezuela’s crude. Over the last six months, Venezuela provided 6.49 percent of U.S. crude imports at an average of 16.153 million barrels per month, or about 500,000 barrels per day (bpd). Since this data is only through October, it does not reflect more recent changes in imports. There are reports that Saudi Arabia, another source of heavy crude, has cut back on its exports to the U.S. since the U.S. provided sanctions relief on Iranian crude exports in November. That was already putting upward pressure on heavy crude prices. The loss of crude from Venezuela compounds the situation. Obviously, the U.S. government is hoping the sanctions will hasten the departure of Maduro. We assume the sanctions would be lifted if he is removed from presidency. The problem is he is unlikely to leave office unless the military turns against him. In the meantime, there could be upward price pressure on U.S. crude, and on heavy crude, specifically. For example, Mars blend produced in the U.S. Gulf is a source of medium/heavy crude. It was trading at minus $4 per barrel WTI, and recently is trading at plus $6 per barrel. For now, U.S. refiners are cutting back on refinery throughput as margins on gasoline have been crushed, which has helped limit the upside for crude prices. The result will likely be a drawdown on U.S. refined fuels inventories, which will improve gasoline’s margin and encourage more crude refining. That will put more upward pressure on crude and consequently apply more upward pressure on propane prices. Ultimately, the impact could raise prices on 20 million barrels of U.S. crude products, and potentially hurt U.S. economic growth. The best case for the U.S. is for Venezuela’s military to turn against Maduro in fairly short order, allowing free and fair elections that help transfer power from Maduro to someone else. Russia is influencing the situation, so that may be easier said than done. 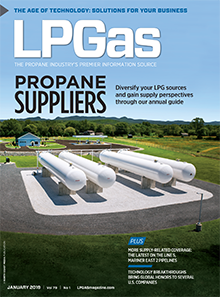 Until there is some resolution in the situation, we can expect volatility in crude’s price and likely upward price pressure – upward price pressure that could transfer to propane prices as well. WHAT IS COST MANAGEMENT SOLUTIONS? For a free 10-day trial subscription by email, sign up online here or call 888-441-3338. 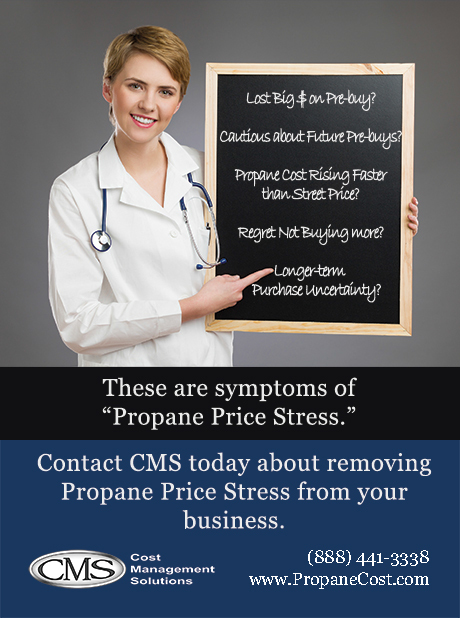 Cost Management Solutions LLC (CMS) is a firm dedicated to the analysis of the energy markets for the propane marketplace. 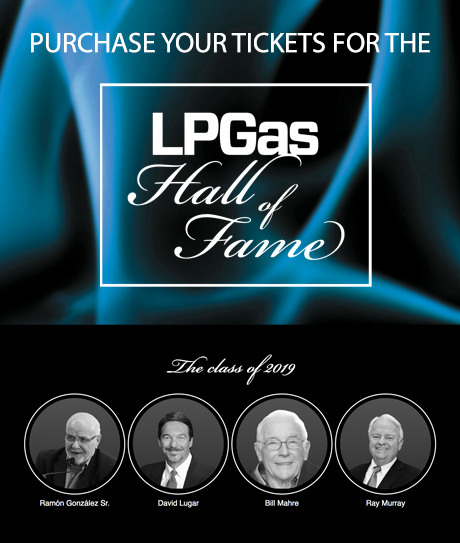 Since we are not a supplier of propane, you can be assured our focus is to provide an unbiased analysis. Contact us today to see if you can benefit from having the Energy Price Watchdog working for you. Many retailers simply don't have time to analyze the large amounts of data to make an informed purchasing decision.